Watch This offers movie recommendations inspired by new releases or premieres, or occasionally our own inscrutable whims. This week, we’re looking back on films that feature great comedic performances that the Academy didn’t nominate for Best Actor or Best Actress. They say that all great comedy has its roots in frustration, embarrassment, and feelings of loserdom, but it was probably more true of Jerry Lewis than of any other marquee name of 1950s and ’60s. Even if you don’t find his live-action cartoon man-child shtick funny, it’s hard not to notice the unease, the vicious mix of anxiety and vanity. And while there are Lewis movies with more technical brio (e.g., The Ladies Man), none are as internally tense as The Nutty Professor, the Dr. Jekyll-and-Mr. Hyde variation that might be his real masterpiece. Lewis’ performance in the movie (which he also directed and co-wrote) is one of the great comedy twofers. He plays Julius Kelp, probably his most notorious and imitated creation, a buck-toothed, accident-prone nerd with granny glasses and a nasal yawp—but also Buddy Love, Kelp’s alter ego, a smooth-talking wolf let loose for hours at a time by a chemical serum. Some have called Love a parody of Dean Martin, Lewis’ straight-man comedy partner in 17 movies, and The Nutty Professor’s central conflict a professional revenge fantasy—the geek who has his life unwittingly taken over by a lothario, but gets the girl in the end by being himself. But the facts don’t support that reading; it was Martin who felt overshadowed, and not the other way around. Besides, Buddy Love doesn’t sound or act like Martin, but like Lewis—the off-camera Lewis, a prickly, condescending bully, speaking in the star’s deeper natural voice. That’s the key psychological subtlety of The Nutty Professor. Love isn’t Julius Kelp’s devilish dark side; he’s the actor who’s been playing him all along. 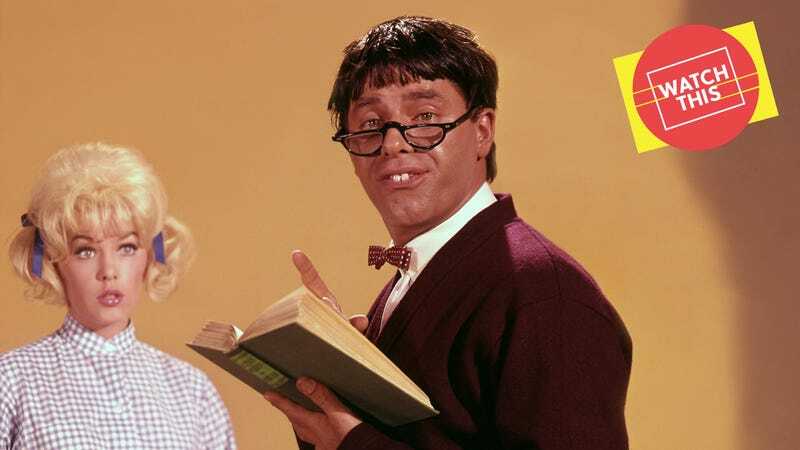 The idea that we are all roles played clumsily by our fantasies and desires is psychologically corrosive stuff, especially coming from a film as garishly colored as The Nutty Professor. The relationship between Lewis’ two performances—one an extreme version of a klutzy persona he’d been developing since the 1940s, the other an over-the-top self-parody—is open-ended. “You might as well like yourself,” murmurs Kelp in his climactic speech, the sweetest and most poignant moment in Lewis’ body of work. “Just think about all the time you’re gonna have to spend with you.” But which “you” is that exactly? One can debate The Nutty Professor’s merits as comedy (we here at The A.V. Club happen to think it’s pretty damn funny), but it’s definitely art. That’s more than you can say about most serious, Oscar-winning performances. Availability: The Nutty Professor is available to rent or purchase through the major digital services. It can also be acquired on DVD from Amazon, Netflix, or your local video store/library.